PureFilter, the most innovative technology to triple filter eco-friendly ground water into purified crispy water without removing the beneficial minerals. 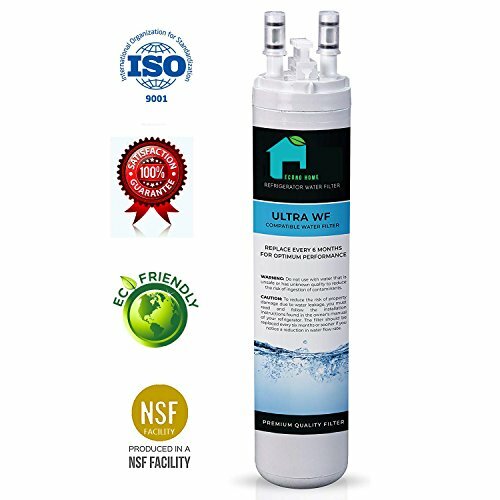 Guaranteed to filter the water from chlorine, dirt, odor, rust, lead, iron, mercury, asbestos particulates, benzene and other harmful sediment. Imagine having access to purified bottled water for free at a constant basis. Our filtered water obtains the advantages of bottled water without spending the expensive price and investing time and energy to buy them at the local store. CERTIFIED AND TESTED by the Water Quality Association to NSF/ANSI 42 standards. Our filter will eliminate all bad tastes and odors that accumulate from the rusty pipes and sediment. Say goodbye to bad tasting water. No special tools required, just click into the filter compartment on the bottom left of the refrigerator and twist right in. And it's ECO-FRIENDLY too, make a difference to the environment! COMPATIBILITY: Compatible replacement for Frigidaire ULTRA-WF, P_N_ULTRAWF, A0094E28261, PS2364646, 242017800, 242017801, 85075-SGP-001, Kenmore 46-9999, 469999, 9999, 25370313211 fridge appliances. PLEASE READ ADDITIONAL REFRIGERATORS MODEL NUMBERS IN THE DESCRIPTION PART OF THIS PAGE! TRIPLE FILTER TECHNOLOGY: Works with an Organic Carbon Block System for THE BEST PURIFIED WATER. Transforms into crystal clear, better tasting drinking water, yet does not remove beneficial minerals. ECONOMICAL: Save thousands of dollars that are being spent on bottled purified water. This filter will purify natural ground water from chlorine, dirt, odor, rust, lead, iron, mercury and other harmful contaminants. FILTER ENDURANCE: Long lasting life spam, up to 6 Months or 200 gallons. Our quality compares to other brand name filters with a reduced price. QUICK AND EASY INSTALLATION: Made for side-by-side refrigerators. The filter compartment is usually found in the bottom left corner of the fridge. Just open the filter compartment, remove the old filter and rotate the new filter into place.